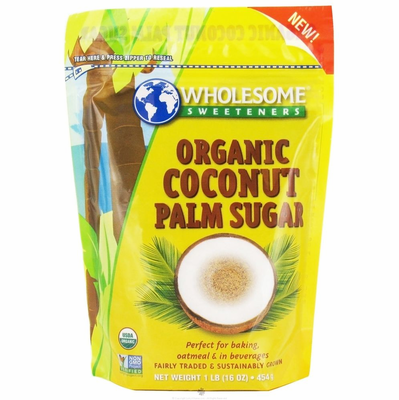 Organic Coconut Palm Sugar is a rich, unrefined brown sugar with a deep caramel flavor. Produced by tapping the sweet nectar from the tropical coconut palm tree flower and drying the nutrient rich juice in a large open kettle drum. The juice condenses into a delicious, handmade whole brown sugar that adds warm color and a depth of flavor to baking. Coconut Palm Sugar also is commonly used to sweeten Asian dishes, sauces and beverages. Also used for traditional food culture fermentation and for making grogs or stronger alcohols. Can use this sugar for many types of cultures, such as water kefir strains, Indian sea rice, or coconut waters. Organic Coconut Palm Sugar is hand made by small farmer cooperatives on the island of Java in Indonesia. Cooperative farmers climb high into the Coconut Palm trees to tap the coconut tree flower for its sweet nectar, similar to tapping a maple tree for syrup.